Home >> Blog >> Can You Schedule Creativity? I was thinking the other day about how I needed to find more time to be creative. You know what I’m talking about – the time to just sit back to dream, feel, create and believe that anything is possible. Given I had been so busy lately I thought probably the best thing to do was schedule some time to be creative. Just as I was about to block the time on my calendar I realized how ridiculous this sounded. I started to think about the whole idea of being creative and when and how does it actually happen. Could I really just ‘schedule’ time or was my structured approach really just defeating the whole purpose. So, where did I go to learn more? Why Google of course. I typed in the search term “how to be creative” and in .61 seconds I was presented with about 959,000,000 results. Needless to say, given that finding time seemed to be my challenge in the first place, I committed to only checking out the top 2. The second search result presented an article from Inc. Magazine – 9 Ways To Become More Creative. These suggestions seemed a little more appealing then the last wikihow article. It was interesting that it didn’t mention once anything about scheduling time to be creative and was more focused on other activities to help develop the mind to be creative. 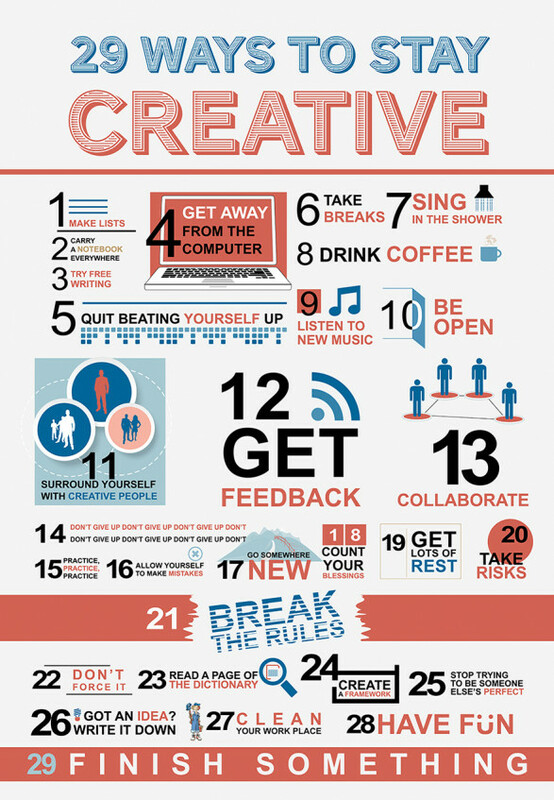 As well, I’m also a big fan of infographics and did find 29 ways to stay creative that I thought I would share. I thought it had some good ideas on how to change up your day so that you allow for more creativity to flow. (the visual is at the bottom of this page). So what have I learned through this exercise of trying to schedule creativity? At the end of the day, I think that being creative is really just a state of mind and something that you can’t really ‘schedule’ into your day. When I think back to the times that I’ve been most creative, it’s when I am in the shower, waiting in a line, sitting on a train and sometimes just when I go for a walk. I think the thing that I probably need most is to allow for space in my mind for my thoughts to wander. Probably scheduling creative time is not what I need as much as just not over scheduling myself so that I actually have space in both my day and my mind to think. Hey – was that a creative thought? ?